Hope all of you Mamas had a FABULOUS Mother’s Day this past week! Son number one had spent the night (son number four still lives with us so was with us too!) to help Robert set up the new television that he bought for my Mother’s Day gift! LOL! Now y’all know who this television is really for, don’t you? He, he … TOO funny and TOO sweet! So, I’m up at 7:00 am on Mother’s Day and by 7:30 am Robert is up and putting on “Avatar” for us to watch for the first time. Shall I tell you that I really had NO interest in seeing it, but while in the kitchen making coffee and cleaning up dishes from the night before, I was peeking at the screen! I took coffee into Robert and sat down next to him on the sofa with mine and did not move! OMGosh! I cried I don’t know how many times watching this movie! I’m not one to watch a movie more than once most of the time, but this one definitely deserves an encore in my book! Daughter number two sent “It’s Complicated” (Meryl Streep and Alec Baldwin), so Monday night was chick-flick night for Robert and I! The writer and director, Nancy Meyers, also did “Something’s Gotta Give” (Jack Nicholson and Diane Keaton), which we have watched numerous times over the past six years and, of course, we just HAD to watch it again after, “It’s Complicated”! LOL! I’ve been away from the computer since last week and hope to be hankering down and doing some designing this week! I’ve missed y’all and hope you’ve been scrapping your hearts out! Let me know what you’ve been up to! I’m dropping in this evening to share a share that I found on Facebook this morning and am just now getting back to my computer to do so! For those of you who have had Photoshop Elements 8 (newest version) on your wish list for any length of time, TODAY is the day to splurge and buy it for yourself or even as a gift for a family member or friend! WHY? Well, because for TODAY and today ONLY, you can pick this SWEET program up for $54.99 (free shipping) with an additional $20 savings via a mail-in rebate, bringing the final cost down to a ALL-TIME low of only $34.99! WOW! Regular price is $99.99. In all honesty, this is the LOWEST price I’ve ever seen Elements sold for and, in my estimation, is TOO good a deal to pass up if you are able to purchase it today! Hope to be seeing you soon with goodies! I think of you all every single day and hope to find everyone happy and healthy! my new adventure and "life's a beach while on vacation" wordart freebie! There’s got to be a morning after and I do believe this is it! LOL! Happy Monday y’all! I hope this finds everyone recovering nicely from the past weekend’s spectacular festivities all about Scrapland in celebration of (inter) National Scrapbooking Day! Family business kept me away from the computer most of the weekend, however, I did grab a few things I was after and even found myself a brand new adventure to embark upon! With my inability to focus on much more than one thing at a time and my dire need to start preserving my own family’s most precious and priceless memories, I was taken to a new site that just started up several months ago called, Open Scrapbook, which is owned and operated by two sisters, Michelle and Misti, along with their husband’s helping behind the scene! Without my going into detail, check it out yourself and if you think it is something that might suit your needs, I would then encourage you to give a try. Membership is on a month-to-month basis and you can cancel at anytime and they even offer a money-back guarantee during your first 30 days if you are not completely satisfied! Click the banner below to give it a peeksie! I have mulled over many different methods of getting my 35+ year collection of photos scrapped and into albums for my children and grandchildren that are multiplying quickly! For those of you who happened to read my post about Shutterfly (click here to read if interested), you will remember my reasons for choosing them over the other options available. This is not to say that I may not have photo books printed elsewhere on occasion, but to accommodate the years and our “huge” family, I am creating share sites as a way to bring us all together to share photos at full resolution and to compile those photos into yearbooks, along with weddings, births, birthdays and anything else we wish to create a photo book for. I am definitely an “all” digi girl for time purposes as well as cost-effectiveness! Although, I shall always welcome hybrid projects of other sorts along the way, as I do enjoy working with my hands too! My first goal at Open Scrapbook is to follow along with Misti’s six-week course on creating, uploading and printing a photo book at Shutterfly (yes, this is what ultimately sold me on giving this a go)! Misti takes you step-by-step in planning, enhancing your photos (the site has many tips, tricks and tutorials for photography and scrapbooking), journaling, etc. Long story short, I am hoping that this will give me the kick in the backside that I need to put aside some time for my own scrapping while still being able to help others in preserving their memories! I love designing and would feel an empty spot if I had to give it up, so this just might be the answer to giving me the balance I need doing both! WOOT! 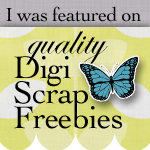 One more share before I leave you with today’s freebie! 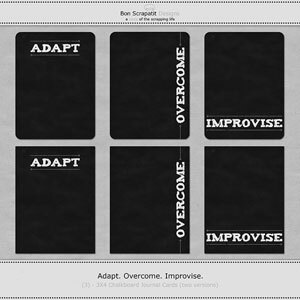 My long-time friend in Scrapland, Kathy Brandt, has a couple of awesome challenges going on over at her site, DigiscrapStation.com! Click on the images below to go to the forum where you can read the rules of each challenge. Each challenge has three software prizes valued at $49 or more. Thank you to Erwin Denissen, High-Logic for donating these wonderful font software packages for the challenges. Today’s goody is coordinating word art to my contribution to the *Summer Surprises* Blog Train. I’ve added an extra link to a “bonus” piece, as in trying to post an image at the beginning of my post and realizing that the black print would meld right in with the background of my blog, I decided to glam it up a bit with a gradient overlay and then added an embellishment! If you don’t wish the “while on vacation” portion attached, you may use your rectangular marquee tool to make a selection around it and then hit the delete key! Bon Scrapatit and see y’all soon! "summer surprises" may blog train and happy international scrapbooking day y'all! Well, speaking of “on track” … TOOT, TOOT! The May 2010 Blog Train is officially departing this beautiful first day of May! Below is a slideshow showcasing the lovely previews from the incredible designers who have generously given of their time and talent to bring you … *Summer Surprises*! These FUN colors will warm you inside and out as you begin to embark upon your spring and summer scrapping, not to mention vacations past! LOL! I resemble that remark as my last post included a layout of one of my sons on his vacation this time last year! There is a plethora of designs on this train … I think of fishing trips, pool parties, swimming lessons, beach outings, tropical vacations, trips to the park, playing in the sand or even in your own backyard! Scraps of your beloved garden, trips to the ice cream parlor, purchases from the ice cream man, a cruise, a trip to the aquarium, water-themed amusement park or a day out on the lake. You can even scrap and create gifts for Mother’s Day! The sky is the limit! Being the first stop this time around, I am posting early to make sure that my blog is ready to roll down the tracks on time! Seeing as it is also (inter) National Scrapbooking Day today as well as the departure of the May Blog Train, *Summer Surprises* and we have designers participating from around the globe, please give a full 24 hours for everyone’s contribution to be posted. If you happen upon a blog that has not posted yet, you can hop over here to The Blog Train Blog to click on the link to the next blog and just make yourself a note of which blogs you may need to visit again. I’d also like to remind y’all, and especially those who might be new to blog trains, that the traffic can get pretty heavy causing for the inability to download right away or even an incomplete download. If you continue to have trouble at any one particular spot, just move on the next and go back later. My personal preference is to wait about a week and then go collecting after the heaviest volume of traffic has passed! Most everyone should be leaving their downloads posted at least throughout the month of May, although they should remain until the June 30th and right before the departure of the next train on July 1st. If you happen to get an incomplete download on anyone’s blog, please remember to delete it from both your downloader and your destination file for a clean re-download. Have FUN everyone! Enjoy the train ride through Scrapland and all of the festivities of (inter) National Scrapbooking Day!